Greetings from Authentic Models! We at AM are very excited to be featured as today's Grommet and hope that you'll share our excitement. We're eager to share some of our AM for Kids collection with you. We design and create these nostalgic gifts because they appeal to our inner kid. When Wendy came to AM and told us about her son's experience with the Message in a Bottle, it made everyone here in the office giddy. We take pride in our collection, and in our artwork and design, and it means a lot to us when other people get as excited as we do. I personally look forward to reading your comments and answering any questions today, and I hope to have the chance to share more stories with you. These gifts are awesome! I was able to check them out in our offices. They are very high quality and have a retro-look to them. Simple, old-fashioned fun!! I'm like Wendy, I like to buy kids' gifts in advance and store them away until needed. I usually go for gifts that are have universal appeal and these are fun for boys and girls. And the packaging is really cute. You won't throw this packaging away! Love Wendy's story about her son's message in a bottle and the note she received from the finder -- don't miss this in the video today! 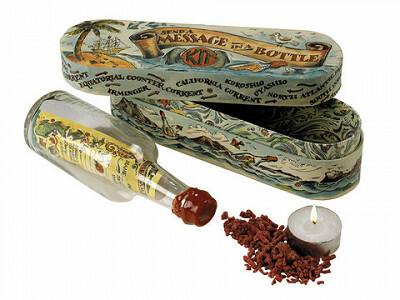 Even if you do not live near the ocean, consider the Message in a Bottle for vacations! It is a fun activity -- especially for a raining day in a tropical paradise. All of these toys require some parental involvement, so keep them in mind if you are looking for something to do with your kids. Enjoy! these are cute. what age range do you think they cover? @Valyri, we are glad you like these fun gifts for kids! We are checking with Authentic Models on what ages they recommend, but I have to say, that my kids, ages 10, 12 and even my 14 year old thought these were "cool". and a candle), but the other three don't. Thank you so much for your interest! There are two types of birthday gift givers. Type One: The birthday party is about to begin, and you’ve yet to make that trip to the toy store. Now, the challenge becomes to shop for a last-minute present, wrap it in the car, and still get to the party on time. Type Two: You always try to have a stash of presents ready to go, but worry about finding the right thing to duck away. No matter which type you are, today’s Grommet is for you. 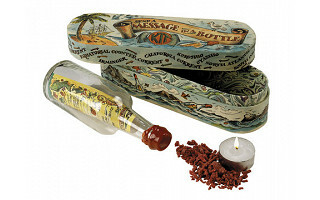 These four unique gifts, inspired by the age of exploration and maritime history, make great presents for boys and girls. The low price allows you (or at least you Type Twos) to buy a bunch and stow them away. Added plus: The outside packaging is so special, you don’t need to wrap them. A bow, a tag and you’re good to go. Now, who’s ready for cake and ice cream?